An industrial hub turned artist mecca, this triangle below Canal Street has recently emerged as one of NYC's swankiest neighborhoods. In addition to a thriving bar, gallery and restaurant scene, Tribeca boasts amazing attractions for families, including a pair of incredible parks, Washington Market Park and Pier 25 right on the Hudson River, a slew of high-end children's boutiques, great indoor places to play like the Downtown Community Center and cool kiddie culture spots such as 92YTribeca and the Church Street School for Music and Art. It's also home to the Tribeca Film Festival, which hosts one of the city's biggest annual celebrations for kids, the Tribeca Family Festival Street Fair. 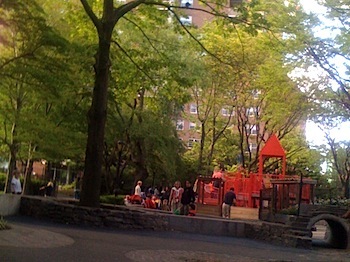 Here are our favorite things to do, see, try and experience with kids in Tribeca.